Germany Burnt a Bridge with Turkey. It Shouldn't Apologise. Germany recently became the 29th country to recognise the mass killing of Armenians by Ottoman Turks during World War I as a genocide. The resolution caused a huge diplomatic setback with Turkey, which still rejects that description of events. Some have argued it wasn't the right moment for Germany to strain relations with Ankara, as it could threaten a recent EU-Turkey deal intended to manage the influx of refugees. But Germany made the right decision. Given the scale and systematic nature of the murders, most historians agree there was a premeditated plan to destroy an entire people, fulfilling the definition of 'genocide' as coined by Raphael Lemkin in 1943. Turkey disagrees with that interpretation. It argues the deaths were part of a conflict where both sides suffered casualties and it's unfair to label one group as victims and cast the other as perpetrators. 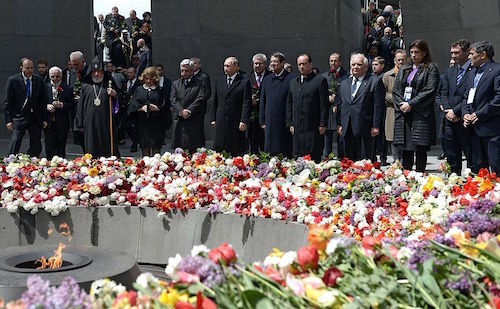 In 2014, then Prime Minister Erdogan offered his condolences to the Armenians for the first time, but an official rewriting of history is still off the table. Many nations and international bodies – including Russia, France and the European Parliament - have officially recognised the massacre as a genocide. Ankara's outraged reaction to the Bundestag's declaration suggests there's more at stake than usual. Turkey's foreign minister dismissed the vote as an attempt to distract from Germany's dark history. President Erdogan said MPs who backed the Armenia motion are "the long arm of the...terrorists”, and some of those MPs allegedly received death threats. Turkey's incensed response to Germany's about-face shouldn't comes as a surprise. As an ally of the Ottoman Empire, Germany reportedly knew about the slaughters and did nothing to stop them. Moreover, after the Ottomans were defeated, some of their leaders fled to Germany with the promise they would not be prosecuted for war crimes. Germany's recognition could be considered an admission of guilt from an alleged accomplice of Turkey, and certainly represents a stark departure from the 'party line'. The spectre of the Holocaust still hangs over Germany; it's keen to show it has changed by accepting responsibility for other past crimes. In contrast, Turkey refuses to face up to its history. Merely questioning its historical treatment of Armenians is still prosecutable as an “insult to Turkishness”. Although German Chancellor Angela Merkel claims her country's ties to Ankara remain strong, the reality seems quite different. President Erdogan has recalled Turkey's ambassador to Germany and threatened further action, while question marks now hang over the fate of the EU-Turkey refugee deal. The agreement has been heavily criticised, and some will consider its unravelling to be a blessing. But international cooperation has been key in managing the ongoing migrant crisis. Germany's recognition of the Armenian genocide could well have political and diplomatic repercussions. But the downsides are outweighed by the benefits: acknowledging a crime against an entire race of people and ramping up pressure on Turkey to brush its bloody past under the carpet.